A few years ago, Zsuzsi Gartner published All the Anxious the Girls, one of the most original, daring, and witty short story collections of this century. Now she returns with Better Living Through Plastic Explosives, a second collection of densely-written, intellectually-complex, and darkly humorous stories. Set mostly in the affluent suburbs around Vancouver, Better Living Through Plastic Explosives takes a hard look at the people we’ve become. We are pretentious but lacking in education; we are politically correct but still small-minded. We whine about the demise of our environment while knowingly engaging in behaviors contributing to its degradation. Ms. Gartner’s conclusions about us are pretty tough. Though her conclusions about us may be grim, Ms. Gartner’s pen is humorous and plot lines are deliciously original. Favorite themes include manhood (or lack thereof), the misdirected sexuality of young women, and children rebelling against stifling upbringings. Faith, movies, art, terrorism, motivational speakers, and IKEA also get lined up for roasting. There are at least 30 passages in Better Living Through Plastic Explosives that are this good. Though the line may be fuzzy, there still is a line between deploying a rapier-wit to make a point and sneering for the sake of sneering. More often than not, Ms. Gartner stays on the right side of this line. But this reviewer wishes Ms. Gartner, or her editor, showed a greater willingness to pare-back on these moments of excess. Just because an author is gifted enough to stuff four biting images into a single sentence, doesn’t mean she should. Even among the highly talented, restraint is a trait to be admired. All the Anxious Girls launched Zsuzsi Gartner into the ranks of the most promising short story authors writing today. 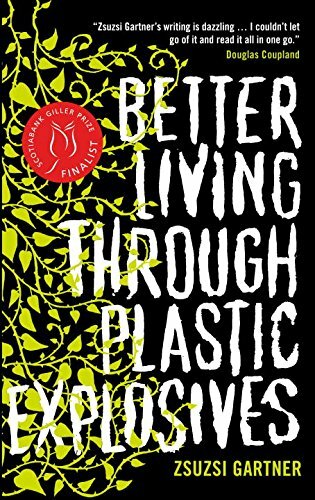 Better Living Through Plastic Explosives doubles down on Ms. Gartner’s strengths: biting social commentary, highbrow wit, and delicious plot lines. In the future, perhaps subtlety will also emerge among Ms. Gartner’s strengths.